Love the songs from Teen Beach Movie? You can now sing along with the Teen Beach Movie Microphone. Singalong to two official songs from the hit movie! Features songs Like Me and Falling For Ya. Batteries included…. Do you love the songs from Teen Beach Movie and wish you were transformed into the musical just like Brady and McKenzie? You can now join in the singing fun with the Teen Beach microphone. Sing along to two official songs from the hit movie; ‘Like Me’ and ‘Falling For Ya.’ Live the Teen Beach life! One supplied; Styles may vary; Size H23.5, W13.2, D4.5cm; Batteries required: 3 x AAA (included); For ages 5 years and over; EAN: 5025123503103. WARNING(S): Not suitable for children under 3 years old. This toy costs approximately £9.99 (for the latest and best prices make sure you check our retailer list for the Teen Beach Movie Sing Along Microphone above). 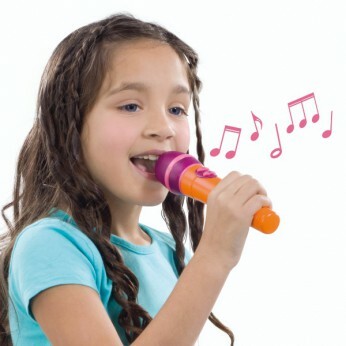 In our review of Teen Beach Movie Sing Along Microphone we classed it as being suitable for ages 3 years, 4 years, 5 years but recommend you check the manufacturer specific advice before purchasing.